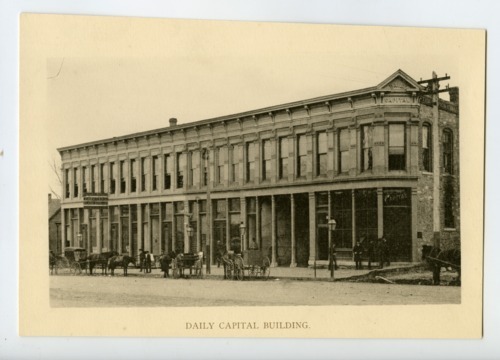 This sepia colored photograph shows the Hudson building located at 107 E. Eighth Avenue in Topeka, Kansas. The two-story structure was named after Major Joseph Kennedy Hudson founder and owner of the "Topeka Daily Capital". From 1886 to 1908, the newspaper was located in this building until it moved to the corner of Eighth and Jackson Streets.